Your Akashic Record or soul book is like a living data base which contains not only current information about the life you are leading, details about the lives you have lived in the past, and what you intend for the future, but every alternative timeline, path not taken and every possible opportunity in between. Using your questions and biographical information I will sort through this to find the answers you seek. 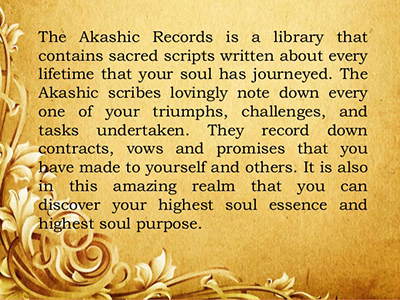 The Akashic records (Akasha is a Sanskrit word meaning "sky", "space" or "aether") are collectively understood to be a collection of mystical knowledge that is encoded in the aether; i.e. on a non-physical plane of existence. The concept is prevalent in New Age discourse and is considered pseudoscience. 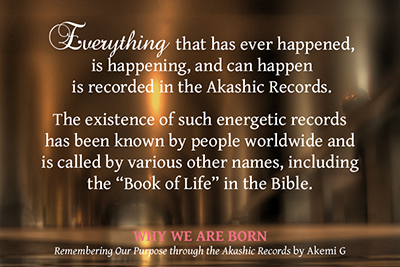 The Akashic Records are understood to have existed since the beginning of The Creation and even before. Just as we have various specialty libraries (e.g., medical, law), there are said to exist various Akashic Records (e.g., human, animal, plant, mineral, etc) encoding Universal lore. Most writings refer to the Akashic Records in the area of human experience but it is understood that all phenomenal experience as well as transcendental knowledge is encoded therein. Those who champion the truth of the Akashic Records assert that they were accessed by ancient people of various cultures, including the Indians, Moors, Tibetans, Bonpo and other peoples of the Himalaya, Egyptians, Persians, Chaldeans, Greeks, Chinese, Hebrews, Christians, Druids and Mayans. It is held that the ancient Indian sages of the Himalayas knew that each soul, jiva, atma, or entity recorded every moment of its existence in a "book", and that if one attuned oneself properly then one could access that book (refer mindstream for example). Truth is, the Akashic Field is part of and connected to the All; in everyone and everything. You have your own Masters, Teachers and Beings of Light that keep track of this information, just for you. We can access these Masters & Teacher and they will answer your personal questions about this life and the past lives which are affecting you today. When you realize that you came into life with a plan, it becomes very useful to access information about that plan. We come to complete some Karma, fulfill our past life Vows or to be with someone special and to support people who are part of our soul family. The human challenge is that as soon as we’re born we forget this plan. At times in our life we feel blocked or constricted or disappointed in our life because we don’t remember why we chose our families or situations. We may feel life is unfair or very difficult. I access the Akashic Records to help you learn information about these situations and to heal and clear the emotional pain. You can ask questions in relation to: health, career, relationships, life purpose, self-esteem and abundance. 1. Looking at your physicality. I will look to see how much of your purpose in this life is already activated, any issues or opportunities you are currently working through and how you are doing so, and get an understanding of how your soul is operating in this embodied life at this time. In addition time is only linear here so the information in your Soul Book all looks like "now" which isn't helpful. I will read the "now" from your body and with this information I will be able to locate it within your Soul Book and orient myself for the reading. There is no need to be physically present for me to do this. 2. Reading from your Soul Book. Based on the questions you submitted prior to the reading and the information we have discovered through your body and energy, I will open your book and begin reading to find answers. Common questions people ask include: What is my purpose for this life? What is the lesson to be learned from (a relationship, an experience, an illness or injury, a pattern of events)? Why did I have the parents I had? How can I (have the life I deserve, transition to a career that fulfills me, find a perfect partner)? 3. I will answer any additional questions that might have occurred during the reading. The process is interactive so as the reading unfolds it is common to discover new questions or aspects of this life to investigate.